A great way to display your knife collection with see thru glass on the top. 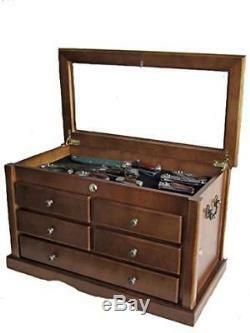 Fine fabric felt matted on the bottom of each drawer to create a elegant display while protecting the knife from damages. Super fine smooth surface and fancy appearance. Holds up to 100 Knives depends on size. 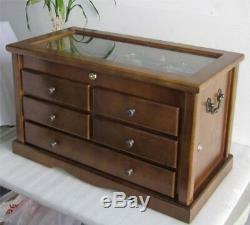 2 Locks, with one on the front for the top shadow box, and one on the side for all the drawers. This masterpiece is a necessity for knife collectors. Dimensions: 12"H X 23"W X 13.5D Weight (net): 28 lbs. Drawer Measurements: Top box interior is 20 1/4"L X 1.5"H X 10W. Drawers: 4 Drawers in the middles are 7 3/4" W X 9 1/2"D X 2 1/4H. Bottom Drawers: 17 1/2"W X 9 1/2"D X 2 1/4H. All drawers can be locked. We strive on providing the finest craftsmanship on all of our products and customer service is our highest priority. Our quality is Satisfaction Guaranteed. In manufacturing, each piece of natural hardwood is hand selected to provide the best raw material for our display cases. While our cases involve an extensive amount of handwork, our craftsmen have used only the finest woodworking techniques. Our collectible display cases' gives you all the principles of "Value": Great Price, Quality, Durability, and Functionality... Which you will love today and tomorrow. Virgin Islands, APO, or Int'l Countries. The item "Knife Display Case Storage Cabinet with Shadow Box Top, Tool Box, KC07-WAL" is in sale since Tuesday, December 18, 2018. This item is in the category "Collectibles\Knives, Swords & Blades\Collectible Folding Knives\Modern Folding Knives\Factory Manufactured". The seller is "bestbuydisplays" and is located in Daly City, California. This item can be shipped to United States.